Trial Starts For Suspects In Ex-Lebanese Leader's Slaying : The Two-Way The four Hezbollah members accused of killing former Prime Minister Rafik Hariri in 2005 are being tried in absentia. Prosecutors in Leidschendam, Netherlands, said Thursday they have pieced together mobile phone data allegedly used by the plotters. Hezbollah has denied any role in the killing. Back row from left, Judge Walid Akoum, Judge Janet Nosworthy, Presiding Judge David Re, Judge Micheline Braidy and Judge Nicola Lettier await the start of a trial at the courtroom of the Special Tribunal for Lebanon in Leidschendam, Netherlands, on Thursday. The trial of four men accused of killing Rafik Hariri and 22 others began Thursday in Leidschendam, Netherlands, on Thursday nearly nine years after the former Lebanese prime minister was assassinated by a massive car bomb in Beirut. Speaking outside the court, Hariri's son, Saad Hariri, who has also served as a prime minister, said his presence and those of family members is "proof that our stance, since the first moment, and every moment, was and will continue to be: seeking justice, not revenge, punishment and not vengeance." The four men accused of the Feb. 14, 2005, killings have never been arrested, and are being tried in absentia on charges of terrorism and intentional homicide. They are all members of Hezbollah, but the Shiite group has insisted it had nothing to do with Hariri's killing. The four men are Salim Ayyash, also known as Abu Salim; Mustafa Badreddine, Assad Sabra and Hassan Oneissi, who is now known as Hassan Issa. Of these, Badreddine is also suspected of being the bomb maker in the 1983 attack on the U.S. Marine barracks in Beirut that killed 241 Americans. A fifth man, Hassan Habib Merhi, was indicted later, and isn't officially a suspect in the proceedings that began Thursday. Calls for an international investigation into Hariri's assassination led to the creation of the U.N.-backed court in 2009. "Presiding Judge David Re says prosecutors will call hundreds of witnesses in a trial likely to take months. "Beginning an opening statement expected to last into Friday, Prosecutor Norman Farrell told the court 'the people of Lebanon have the right to have this trial, hear the evidence and seek the truth. "He said the prosecution case is made up of evidence including large amounts of data from mobile phones allegedly used by the plotters to plan and execute the bombing. "Farrell showed the court photos of the aftermath of the attack, including a smoldering, rubble-strewn crater around 12 meters (40 feet) across and the flaming wreckage of the truck. He told judges attackers packed 'an extraordinary quantity of high grade explosives' into a Mitsubishi truck to kill Hariri. 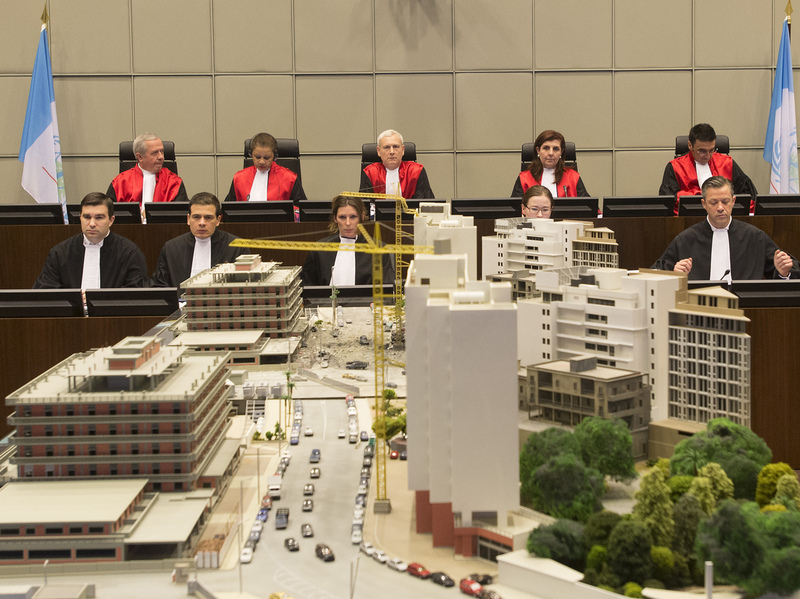 "A scale model of the blast scene stood on a table in the center of the courtroom, which has been purpose built in the gym of a former Dutch spy agency's headquarters. "Another prosecutor, Alexander Milne, said the blast created 'a man-made hell.' He showed videos of the immediate aftermath and photos including one he said showed Hariri's body covered by a plaid blanket." Meanwhile in Lebanon, a car bomb near a government building in Hermel, a Hezbollah stronghold, killed at least four people and the bomber.